Hey! It’s Tuesday! And not just any Tuesday: if you’re living in the United States, it’s two days till Thanksgiving. And maybe you’re hosting, and you delegated dessert to somebody else, but they suddenly had to decline the invitation. Or maybe you’re attending a gathering, and you suddenly realized that while you have your required side dish planned, you haven’t planned your dessert. (Surely my family’s not the only one that requires all attendees to bring a side dish and also a dessert, right?) Or maybe you’re not even in the States, and you just want an easy, satisfying dessert that’s great warm or cold, fresh out of the oven or two days later as a midnight snack straight out of the fridge, all from ingredients you might well have in your pantry. Folks: I’m here for you. The basic premise for this recipe comes from Dan Pashman (of The Sporkful) and Brooke Gladstone (of On the Media). Brooke and Dan get together in a terribly cute video to make one of Brooke’s family’s favorites, apparently an old Mennonite recipe called ‘cracker pudding’. Dan calls it “a rich, creamy, salted coconut concoction that made me want to curl up on the couch in my pajamas and watch Steel Magnolias.” When I heard this segment on the Sporkful podcast, I wanted to make it immediately. What’s not to love: smooth, creamy coconut pudding thickened and seasoned by crushed saltines, those unassuming snacks transformed into something sublime, and yet still humble. I mean, come on. …oh buddy. I may have eaten a quarter of this before anyone else got to it. (And by ‘may have’ I mean ‘definitely did’.) I encourage a little more restraint, if only so you can share it with those you love. But if you dish it out into some cute little bowls, no one can see the missing scoop in the corner. 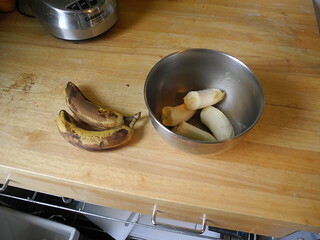 Remove from heat and stir in the crackers, bananas, and vanilla. Pour in 2 qt. baking dish (I used an 8 in. x 11 in. rectangular dish) and set aside. 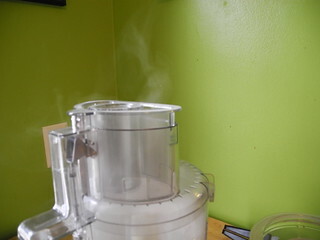 In a food processor, whizz the white sugar until fine, about five minutes. 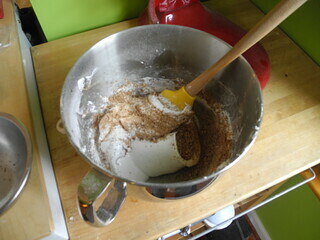 (Don’t be alarmed if you see white wisps coming from the bowl; that’s finely powdered sugar seeping out.) Pour out the fine sugar and set aside. In the same processor bowl, pulse the pecans until they are finely ground. Be careful not to over-process, or you’ll make pecan butter. 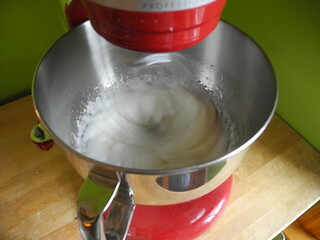 In a stand mixer with a whisk attachment (if it has one, or with standard beaters if not, or even with a hand whisk if you’re determined), beat the egg whites until they form stiff peaks. 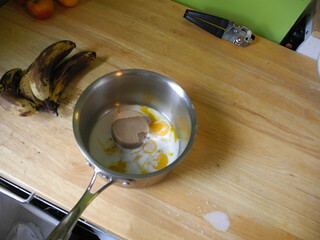 Gradually add the fine white sugar and continue beating until the whites are glossy and thick, and the sugar has fully dissolved (the meringue should not feel grainy). Fold in the ground pecans with a spatula. 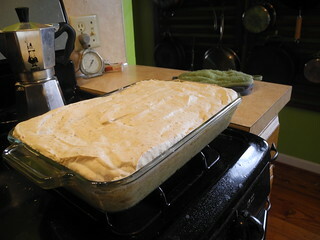 Spread the meringue evenly over the banana mixture, and bake for 12-15 minutes until the meringue has developed a hard crust and darkened slightly. May be served warm, or you can let it cool before chilling at least a few hours, then serve cold. Nut allergy? Just don’t like pecans? Leave ’em out, swap ’em out for another nut, either way. Other crackers would work, so long as they’re not too herby. Ritz or butter crackers would be delicious.